We’ve already tipped our hand by publishing two podcasts on the topic: Adaptive Content: A Trend to Pay Attention to in 2015 and Behind the Scenes: 2014 in Review and the Road Ahead. And 16 Stats That Explain Why Adaptive Content Matters Right Now is a foundational blog post that briefs you on the subject. At this point, it’s only natural that we jump right in to the heart of adaptive content. And start with content strategy. Can you really trust your content strategy? Content strategy needs to be precise. See, before you even put pen to paper, you need to know the direction you are heading. Most of us who work online, from freelance writers to small business owners, probably have a content strategy. But there’s just one problem: it’s up in our heads. Only 39 percent of B2B small business marketers have a documented content marketing strategy. The rest either have a strategy that they have only talked about (47 percent), have no strategy at all (12 percent), or are unsure (1 percent). That’s from the 2015 benchmarks, budgets, and trends study by Content Marketing Institute (CMI) and MarketingProfs. So, let me explain the danger behind an undocumented content strategy. First off, the difference between keeping that content strategy pinned to your mental wallpaper and taping it to the physical cinder blocks in your basement office is that your supposed strategy that you talk about may be no strategy at all. 60 percent of those with a documented content marketing strategy consider their organization to be “effective” at content marketing; only 33 percent of those with just a verbal strategy say the same. 62 percent of those with a documented strategy say that their strategy closely guides their content marketing efforts; only 29 percent of those with just a verbal strategy say the same. Companies with a documented strategy are more than twice as likely to be successful at charting the ROI of their content marketing efforts than those with only a verbal strategy. So, that notion you call your content strategy may be causing you to leave money on the table, publish ineffective content, and aimlessly feel your way to your destination, which might end up being the wrong destination after all. You need a clear and focused content strategy to produce optimal results. We’ve already made the case for content. But if you need a little reminder, here are some words of wisdom from Authority Rainmaker 2015 speaker, Ann Handley. But it can be tricky. Especially if you target more than one audience. And CMI’s research reveals that 54 percent of small businesses say they target at least two or three audiences. Only seven percent said they target just one audience. Throw in the different tactics you can use, social media platforms, paid advertising methods, as well as a limited budget and resources, and it becomes clear that a defined content strategy is necessary if you want to have any hope of remaining focused. Certainly having a content strategy is better than not having one. But a documented one is superior. Your content strategy defines how an organization (or project) will use content to achieve its objectives and meet its users’ needs. Your content strategy helps you see clearly, avoid excuses, and remove distractions. It’s there to keep you accountable. But creating a content strategy doesn’t have to be a frighteningly massive affair. You can create your first draft in less than a day, just by answering a few questions. So, square away an afternoon, ask yourself these questions, and document the answers in a notebook, on a whiteboard, in Evernote, or in the handy PDF we’ve created for you below. Have fun! Identify and specifically describe the members of your audience. She is a working mother who would like to feed her family a healthy meal three times a day. He is an African American who wants to become a lawyer so he can give back to his community. She is retired, without any concerns for money, but simply wants to be productive and not bored. As mentioned above, you may be speaking to more than one target audience. Define all of them. This may require you to delve pretty deeply into their heads. And I’m not just talking about your direct competitors. Who or what can take prospects away from you? For example, a web designer is not only competing against other web designers, but also against tools that allow non-designers to design. 3. What do you bring to the table? There is a reason I discussed your customers and competitors first. They give you an idea of the shape of the market and how you can fit into that market. I say this all the time to people who are trying to build a business and a brand: Your mission and strategy will change over time. It will evolve as you learn about your customers and competitors. With that research in your belt, you now can ask: How do you fit into the market? What do you bring to the table that no one else can? What makes you unique? 4. What do you hear? Hopefully voices. But not the ones in your head. I mean the voices from your customers and ideal target audience. What are they saying? What are the recurring themes, in regard to their dreams and challenges? If you don’t know where to hear these voices, find the online water coolers where your prospects like to hang out. They could be on social media sites like Reddit, Facebook, Google+, or Twitter. Also consider LinkedIn discussion groups, forums like Quora, or membership sites like Authority. 5. What content do you already have? You need to assess the content you already have on your website, blog, and social media platforms — and how far along you are into the content marketing game will determine how painful this will be. But it’s important it gets done. Yes, this is a content audit. Ultimately, you want to determine the type of content that would be the most beneficial to produce going forward. 6. What is the purpose of your content? This is perhaps the most important question. Is your content intended to drive sales? Generate leads? Build authority? Increase organic search traffic? Please your mother? All of the above? More than likely “all of the above” is the case, but each individual piece of content will accomplish a different task. For instance, the purpose of an article you wrote on another blog may simply be to drive more traffic to your website. But not to just any page on your website — a landing page specifically designed for that guest article. A landing page designed to convert those visitors into email newsletter subscribers. And that email newsletter is designed to strengthen your relationships with your readers and educate them on your products or services. For instance, one email you send may be crafted to drive those subscribers to another landing page designed to sell them your product or service. It’s important to understand the purpose of your content. And the purpose of each piece of content can be determined during your content audit. 7. How often should you publish content? Once a week? Daily? Answers to these questions boil down to your resources. How much time do you have? Who is going to create all of this content? Is the content converting? Here’s some insightful research from Andy Crestodina to help you make that decision. 8. How will you distribute your content? Content that isn’t shared is content that is ignored. No matter how great you think it is. So, which social media platform(s) will you focus on? Where is your ideal audience? Who is going to share your content? Are you going to use scheduling tools? 9. Who is in charge of your content? Is it you? Should it be you? Like Michael Gerber said in his classic book, The E-Myth, a business owner should be in a position to work on his business — not in it. Otherwise, you may find it difficult to grow. You may need to hire someone to write new content and manage existing content. 10. Who will produce your content? You may have a lot of wishes and desires. And no shortage of ambition. But allow human nature to teach you a lesson: We are all limited in what we can do. If you want to create 12 infographics this year, who’s going to do the research? Write the content? Design it? Will these people always be available when you need them? 11. Who is going to maintain the content? The content on your website is like a garden. It needs to be cultivated. For every new blog post you publish, there are five rotting away with broken links, outdated facts, and topics that are now irrelevant. Who is going to clean up this mess? Name that person, and create a schedule. 12. Who is responsible for the results? If you’re the only content creator, easy enough. You are responsible for everything. But if you have a small team, make each person responsible for some area of the content. As Patrick Lencioni explains in his book, 3 Signs of a Miserable Job, you will provide motivation to your team by measuring their performances. Make sure these goals are measurable, achievable, and specific — and not ultimatums. In other words, don’t say, “You’re gone if you don’t meet this.” Allow room for mistakes, corrections, and growth. In addition, you should be held responsible for an area of the content as well. Your people will respect that. 13. What’s your destination (core strategy)? All the preceding questions build to this final one. This is about stating what you need to accomplish, determining the type of content that will help you achieve this goal, and creating a plan to help you accomplish it. Aspirational: Create a goal that gives you room to stretch, fail, get back up, and grow. Flexible: Your core strategy should allow you to adjust as your environment changes around you, without having to make a drastic pivot. Meaningful: Does your core strategy align with your values, and will you be able to sustain it and endure challenges over the long haul? Curate an entertaining, online reference guide that helps stressed-out law students become successful practicing lawyers. This is similar to five things every good marketing story needs: it’s clear who the hero is, what her goal is, what the moral is, what the conflict is — and, of course, you are the mentor. 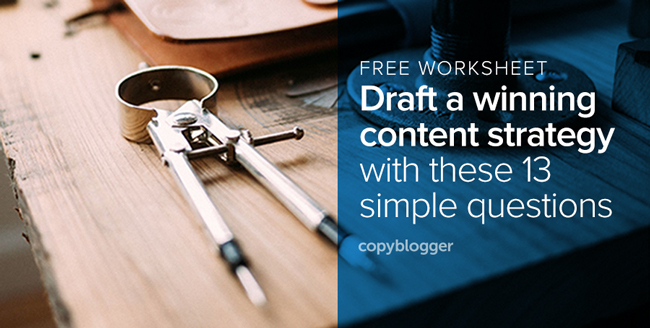 Once your draft is complete, your next job is to download (221 KB) and print this nine-page content strategy worksheet. Fill it out, and pin it in a spot you will see every day. In the end, your core strategy will guide you through the distractions and difficulties that accompany building an online audience with content. But the rest of the information you collect will tell you where you are now, where you need to go, how you are going to get there, and the resources you need. And be sure to share your progress with our discussion group over on LinkedIn! Editor’s note: Many thanks to Copyblogger’s Pamela Wilson for designing this worksheet! Image source: Jeff Sheldon via Unsplash.